Here is a rare complete set of nine lithograph/prints including one of Senator McGovern during his presidential run that year as well as eight others signifying campaign issues.The content page lists the artists with a small box picture of their work/issues. 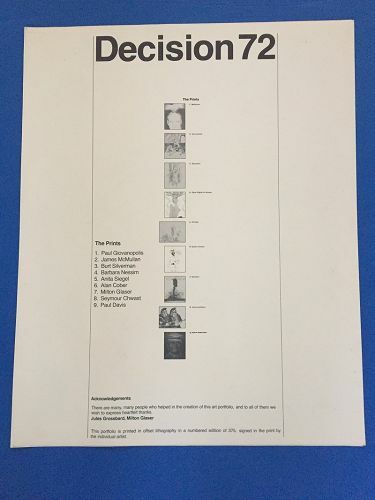 It is noted that the prints are issued in offset lithography in a numbered edition of 375, and signed in print by each artist with the EXCEPTION of the McGovern print.Each Measures 16" x 19.5" They include: 1)McGovern by Paul Giovanopolis, 2)Environmental by James McMullan, 3)Education by Burt Silverman, 4)Equal Rights for Women by Barbara Nessim, 5) Ecology by Anita Siegal, 6) Senior Citizens by Alan Cober, 7) Nutrition by Milton Glaser, 8) Arms Limitation by Seymour Chwast, 9) Native American (colorized)by Paul Davis. The content page has faint foxing on the upper right and left outside border as well as the lower left, the McGovern has a tiny brown spot on the right border, Ecology- small brown spot upper left of signature,Equal Rights- 3 small brown spots (2 on the left side, 1 in the upper right corner), Environment - a tiny spot on the right border.Original marbled box included.